Holidays with preschool-aged children can be a wonderful time. For perhaps the first time, your little one will become more and more aware that something special is coming up, and you may be wondering the best ways to celebrate the Advent season in an age-appropriate way. How can a preschooler best experience this festive time? Here are three simple traditions you can share with parents to include in their celebration that will help their children grow in faith as they get ready for Christmas. Parents may find that their child has a lot of questions about Christmas. Even things that were discussed at ages two, three, and four may come up again at age five. 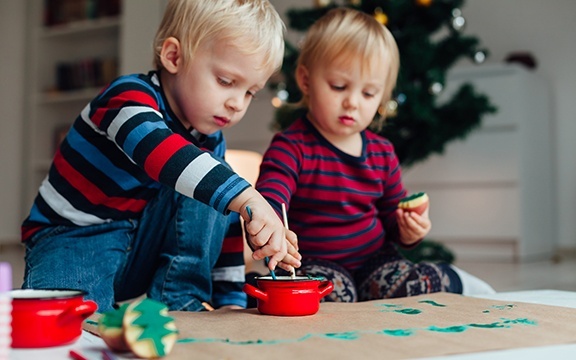 That’s because, developmentally, so many changes are going on in their little brains that preschoolers experience the holidays in a brand new way each year. It can be a little confusing for young children, so it’s good to find creative tricks to understand what’s happening all around them. One super effective way to help answer those questions? Pick a few developmentally appropriate books to read aloud to children throughout December. Children at this age LOVE repetition, so don’t worry about finding a bunch of different stories. Picking 3-5 books to add to your library will be plenty. In our family, we packed these books up with our Christmas decorations each year, so that bringing out the familiar tales was part of our seasonal kickoff. Choosing faith-based books is an excellent way to keep Christ at the center of attention in the midst of all the hustle and bustle. Need a suggestion? Check out Beaming Books’ Rufus and the Very Special Baby to share the story of Jesus’ birth or our Frolic Bibles Bundle for a full collection of Bible stories! Because small children have a very unrefined sense of time, one of the most common family traditions for littles is some form of an advent calendar. There are many ways to do this with your pre-readers, ranging from homemade or store bought. Some are more like a visual reminder, like paper chains and other pictorial versions. Others have small treats for your child to discover each day as they count the days to Christmas Eve. This helps with the anticipation and can help with understanding of how much time until the big day. These types of calendars can also be used is to help your child grow in faith. Adding parts of the nativity story to the links on a paper chain, or choosing a calendar which highlights the birth of Christ is a great tool for helping stir up the curiosity toward the true gifts of Christmas. Children at this age are naturally very egocentric. Pair that with all the advertising and store displays, and our poor littles tend to get pretty swept away with focusing on what they can get out of Christmas. It’s important to purposely plan times for your children to think of others year round, but especially this time of year. Search out opportunities to involve preschoolers in a project (or several!) that will help shift their focus onto Christ’s command to love one another. Interested in ideas? Check out our list of service project ideas for all ages for this Christmas! If you are able: Involve little ones in as many steps of a project like this as you can. Let them help you pick the child, choose the gift, wrap it (if allowed), and turn the gift in. Plan for your child to make gifts for people they love – remembering siblings, grandparents, cousins, neighbors, teachers, and friends. These don’t need to be complex Pinterest-worthy gifts – a simple hand-colored card, colored-in Christmas story or painted rock can be a wonderful way to help your children focus on the giving of Christmas instead of the getting. It’s easy to get wrapped up in our efforts to make Christmas a magical time for our children and forget about the importance of moderation and self-care. In the next post in this series, we will cover some simple ways to enjoy the season with our preschool children without bringing unnecessary chaos on ourselves. In the meantime, check out our other Christmas blog posts and offerings on our website! Amber is a speaker and writer with over 25 years of experience in early childhood development and children’s ministry. She works as an associate professor at Mt. San Jacinto Community College in the child development education department, and as a grant program director for two nationally accredited preschools. Amber enjoys "small town" Southern California living with her husband of 25 years, Jason, and their three children.